A/B testing is the best way to find out how you can mold your website to optimize conversions. However, it does not guarantee better numbers for your business. If you go about A/B testing incorrectly, your efforts could amount to striking the air—leaving you frustrated, tired, and with nothing to show for all your efforts. Should You Split Test Your Pricing Strategy? To give you an idea of how powerfully pricing can influence consumer behavior, consider the results of a recent study done by three management professors at Yale. The study gave subjects $1 with which they could either buy one of two packs of gum or keep their money and buy neither. When the researchers priced both packs of gum equally at 63 cents, only 46 percent of subjects made a purchase. By contrast, when they priced the packs of gum at 62 cents and 64 cents respectively, 77 percent of subjects made a purchase. Clearly, even the slightest variation in price can have a profound impact on sales, which is why more and more companies are trying to take the guesswork out of pricing strategy by split or A/B testing price. Split testing can give businesses insight into what to charge and how to display price by revealing how actual customers respond to different pricing scenarios. Posted in Conversion Strategies, Conversion TestingLeave a Comment on Should You Split Test Your Pricing Strategy? In 2013, Wikipedia needed to do some fundraising to help keep the company on its feet. The money raised would ensure that necessary aspects of the company, such as the servers, could continue to function. Those in charge of the fundraising campaign decided to do some split testing utilizing different banner designs to test visitor reactions. Let’s take a look at what they did, and how it affected their income. Wikipedia started the testing trying to learn if there was a difference in the color used to highlight some of the text in the banner. Each of these banners were yellow, one with a cyan highlight, and the other with a brighter yellow highlight. These banners were tested in July and August, and they declared the yellow highlight the winner. We at ConversionVoodoo understand the importance of giving, which is why we donate time every month to help out some of our favorite non-profit organizations. 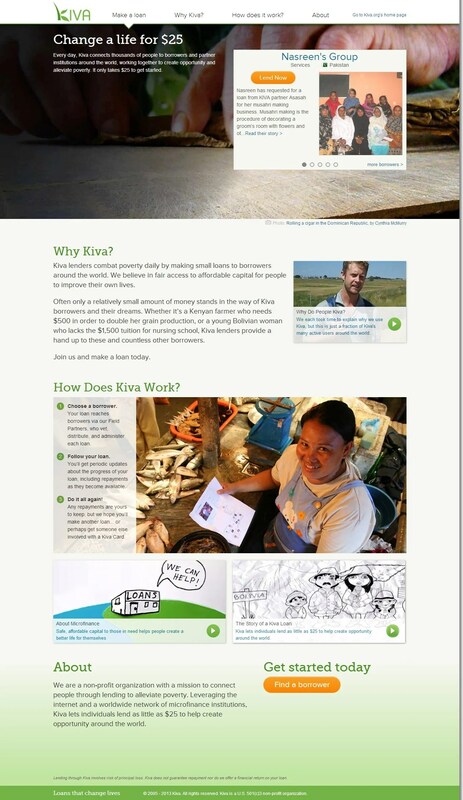 Last month we finished a batch of testing for Kiva, a non-profit organization with a mission to connect people through lending to alleviate poverty. Leveraging the internet and a worldwide network of microfinance institutions, Kiva lets individuals lend as little as $25 to help create opportunity around the world. Our focus was on landing pages given to first time visitors, with the aim to increase signups (a $25 loan donation). As you can see the page is already pretty solid: enticing headline, clear call to action, and explanations of who, why, and how. We have a challenge on our hands! Around the holidays we like to remind our readers of a little advice that could double your conversion rate this holiday season. 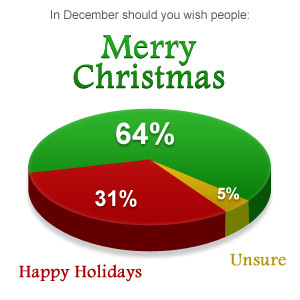 Is it better to wish your guests a “Merry Christmas” or “Happy Holidays”? Posted in Conversion Strategies, Conversion Testing, Copywriting Tips2 Comments on “Merry Christmas” or “Happy Holidays”? Choose wisely!